The four spiritual paths of karma-yoga, bhakti-yoga, rāja-yoga, and jñāna-yoga examined through Jyotiṣa. 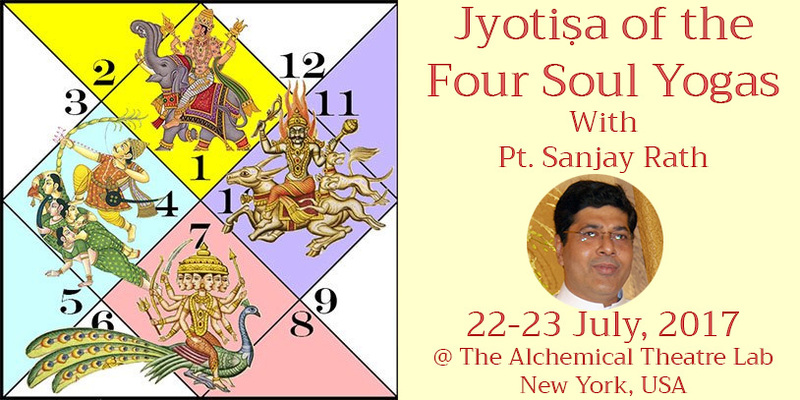 Starting with Puruṣārtha as Jyotiṣa Foundation, we learn how the desires in the soul shall manifest. Pain and suffering is not due to the desire itself, but due to attachment to the desire. The four spiritual paths of yoga viz. karma, bhakti, raja, and jñāna are those of the chara ātmakāraka with other charakāraka. While all four paths are very desirable, not all are easy for the individual. We examine the formation of these yogas, their obstacles and the soul’s journey through this mundane existence. Puruṣārtha Kendra: We examine the puruṣārtha directions of a graha based on its kendra in rāśi and navāṁśa as well as its mental directions based on the nakṣatra pada. And to what extent is this in harmony with the mind. Four Soul Yogas: Study the chara kāraka and the implications of ātmakāraka (soul significator) forming yogas that point to the four puruṣārtha as well as how these influences the four spiritual paths – rāja, karma, bhakti and jñāna yoga. Kāraka Lagna: Timing the awakening of the soul and how it overcomes its principal desires. Mokṣa Yoga: Which of these four spiritual paths is best suited for the individual. Parāśara’s Mokṣa Yoga and its application. This entry was posted	on Thursday, January 12th, 2017 at 7:08 am	and is filed under Jyotish News. You can follow any responses to this entry through the RSS 2.0 feed. You can leave a response, or trackback from your own site.